Packaged Anodesare prepack ineither bags orcardboardcartons in lowresistivity,quick wetting, prepared back fill consisting of 75%hydratredgypsum,20% bentonite, and 5%sodium sulphate.Connecting Wire: Standard10 feet of solid or stranded#12 AWG Copper LeadWire. Al Zn Mn Mg Fe Cu Ni Si Other Imp. Main application: Sacrificed magnesium anode suitable applies in the fields of anticorrosion. Such as: Oil, gas, water transmission in underground or fresh water, underground cable, chemical, communication, bay, watercraft and reservoir strobe. Main application: Water heaere, water container, pre-polarization of steel structure in seawater, gas pipe, anticorrosion of steel and iron structure where high resistant and electrolyte (soil and water) existed. Main application: Ribbon anodes are used for the cathodic protections of sleeved pipings, tanks and pipe networks ad grounding grids guarding against heavyy current interfereence. And temporaly cahodic protection of pipings. 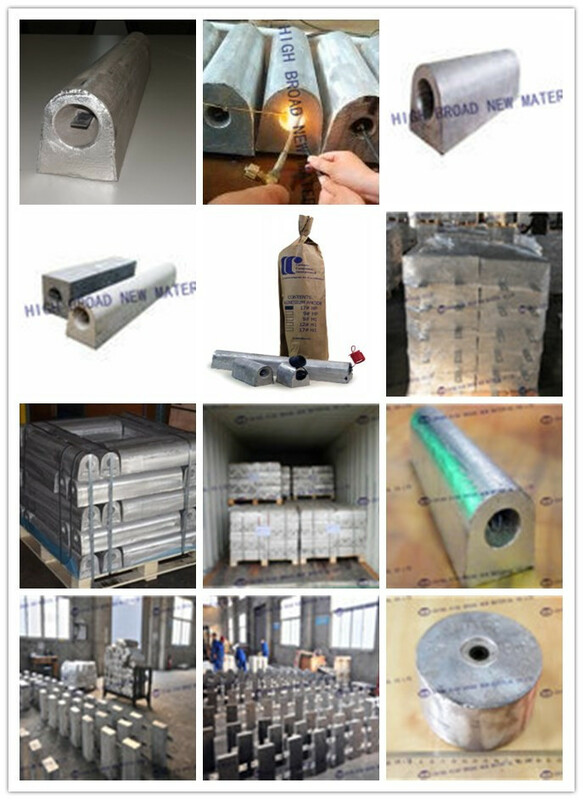 Main Application: Aluminum anodes are suitable for the cathodic protection for such metal structures as ships, machinery, offshore engineering, harbor facilities, and pipings and cables in an ooze corrosion environment. Main Application: Zinc anodes are sitable for the cathodic protection for ships machinery, offshore engineering and harbor facilities in seawater and fresh seawater andd for pipes and cables embeded in soil with cower resistivity. Main Application: It is widely aplied to the impressed current cathodic protection of oil drilling platform at sea. Bried pipings anad cables under ground. 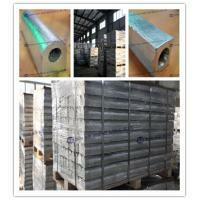 Above bare Mg anodes could be supplied after being prepackaged. The bare Mg anodes will be assembled with cable and sealed with epoxy resin, and packaged in cotton bag. As the prepackaged anodes are buried under the ground, if there is any harmful element in the backfill of prepackaged anodes, this element will leak to the earth and groundwater when the anode is used, which will pollute the environment. CORRTECH prepackaged anodes are made of recyclable materials or easily decomposable materials and the content of harmful elements in the backfill is lower than safety standards, which will not bring any pollution to the surrounding. The available cables type (insulation / sheath) are: PVC/PVC, XLPE/PVC, HMWPE with cable size: 6mmsq, 10mmsq, 16mmsq. Usage: Magnesium Sacrificial Anode has a very wide protection in vessels, ports constructions, ocean projects, underground cables, gas and water supply systems, drainage lines, chemicals, telecommunications, water boiler, heat exchanger, vapourater, etc. Al-Zn-In alloy sacrifical anode is applied for the cathodic protction of vessel, mechanic equipment, Ballast Tank, tank inner, seashore facility, seabed pipeline, dock steel peg, ocean platform and cable ect. Which applied for the seawater as the medium. NOTE: If there is no the size which you need, please give us your Drawing and the size of the anode, we will make the anode by your information. Below are the results from the electrochemical evaluation of the cast 9D3 magnesium anode. The heat number is 31502101-004 with a P.O. # HB. The testing was done in accordance with ASTM G-97 (Laboratory Evaluation of Magnesium Sacrificial Anode Test specimens for Underground Applications ).